2018 Baltimore Women's March. Photo from Wikimedia. If you are an active social media user, you have probably seen the #MeToo on your feed, or on the explore page. People of all ages, in different countries, with different time zones, that speak different languages, that contribute to different cultures have uploaded a post using this hashtag. But, what does it mean? 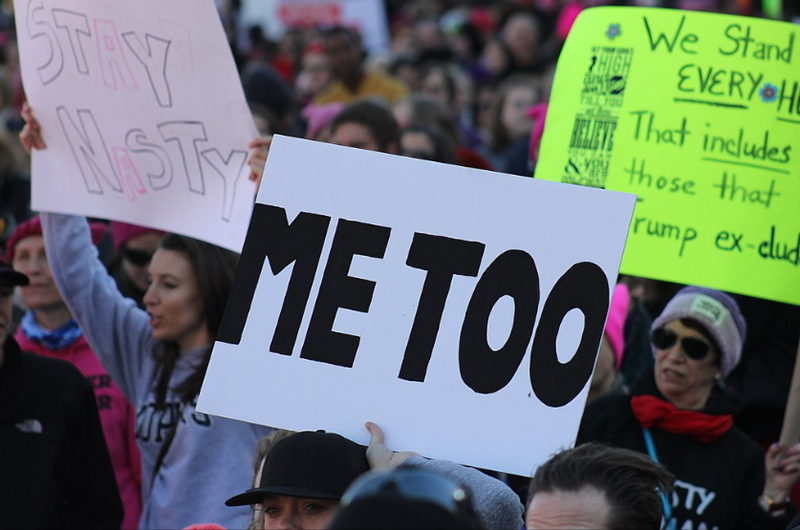 #MeToo comes from the ‘me too’ movement that provides awareness and breaks the silence about sexual abuse and violence. In the past year the ‘me too’ hashtag has blown up on social media. Twitter, Instagram, Snapchat, and Facebook have all undergone a realm of ‘me too’ supporters, all of which are promoting awareness for sexual violence, harassment, and abuse. Yes, it is a hashtag, it proves it’s point online, but what does this do to help in real life? ‘Me too’ offers community organizing resources that can help interrupt the act of sexual violence. This hashtag is meant to do more than just prevent sexual violence, but also to inform people all over the world what tragedies like this can do to someone and how it can affect them. If you search the hashtag online, images will pop up that provide pictures of protests, posts from victims telling their ‘me too’ stories, and some of just your average people supporting the movement itself. The original ‘me too’ movement was meant to provoke awareness for “black women and girls, and other young women of color from low wealth communities to find a pathway to healing,” states Tarana Burke, who once worked as a youth worker and dealt with children of color, as she states, "that had been affected by sexual violence." This movement has become so much more since then. This act began in 2006, and now in 2018 has become a platform of awareness, for not only sexual violence, but racism, and sexism as well. This hashtag does so much more than just alert people about sexual violence. It is a way of comfort, knowing you are not the only one, that other people understand what you are going through. It gives hope to those who think that they have to hide from the world because of sexual abuse in the past. It allows victims to see the brighter side of the situation. To know that people are there for them. Other people have gone through this same exact thing. It focuses on individual healing, and to bring a new outlook about sexual violence, encouraging victims to come out, and to share their story to make awareness. Many men and women have become more open about their stories as they are providing awareness to everyone, online and in real life who were not so educated about this topic. The ‘me too’ movement even has its own website, providing blogs from victims about their stories, why ‘me too’ was created, the vision for ‘me too’, but most importantly, it provides resources. Healing resources, advocacy resources, and national resources, all of which you can get help and prevent sexual violence in your community, or even household, if that is the case. When people think of sexual violence victims, they tend to look at the women, but ‘me too’ has been quite an eye opener about men having gone through sexual violence as well. “Over the past year [they have] gotten used to women stepping forward and sharing their stories about sexual abuse. But there are many more people out there - including male victims. Studies show one in three women are sexually assaulted before 18 and one in six men,” says Megan Magensky a KEPR-TV News Staff reporter who had interviewed a male sexual violence victim, Tedd Cadd, who had been sexually abused by his own father at the age of 5. Some men think that this movement shines a light on female victims, and not so much on the male victims. “In some ways, [he] think[s] women have been more courageous than men to tell you the truth,” said Tedd Cadd. Studies show that more men, are ashamed of telling their stories than women are, and a higher percentage of women come out about their stories than men, so that leads the light to shine brighter on female victims. The ‘me too’ movement has allowed male victims to come out about their stories as well, and has provided a place of care for them, making them feel just as welcome.